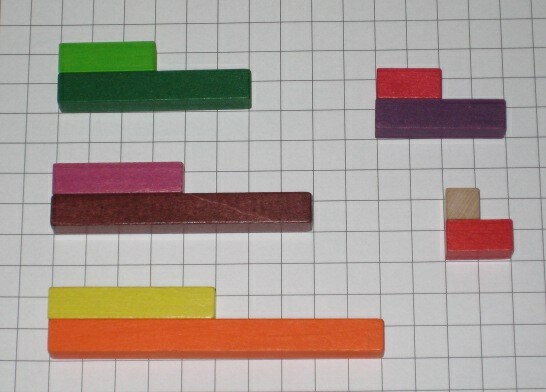 Cuisenaire rods are colorful wooden rods ranging from 1cm to 10cm lengths. They’re great for creating patterns, counting, sorting, measuring, adding, multiplying, and all sorts of other fun explorations. Although the rods were originally created for formalized classroom use, as a curriculum component, I hope you choose to just play with them instead. I think your experiences with them will be more enjoyable and longer lasting that way. If you treat them like workbooks and assignments, it may detract from the intrinsic fun and natural learning that’s possible. The following are some of the ways we’ve played with them over the years. Enjoy! Use the rods to create patterned designs. Experiment with symmetrical and asymmetrical patterns. Think about the colors and sizes of the rods first rather than the numbers. Use the rods alone, or the rods and tracks, to create varying lengths of trains. Use all one color rod, two colors together, or a combination of colored rods for different trains. Use the 50cm or 100cm tracks to measure the trains easily. Use dice to add or multiply numbers to determine how long of a train to create. Use rods to create varying heights of staircases, maybe with a difference of one or a difference of two in each step. See the first couple photos above. These are fun games to play with a partner, and a great way to familiarize yourself with the rod colors and their corresponding number values. 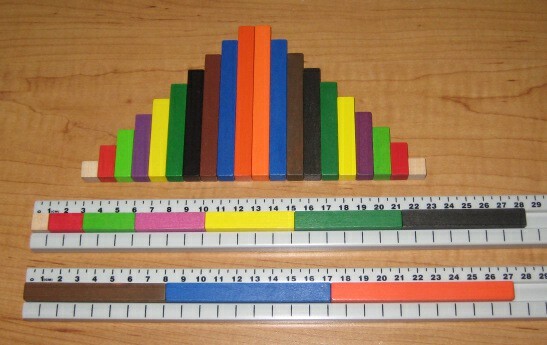 You can play these games with either 50cm or 100cm rod tracks, a set of Cuisenaire rods, and a set of dice. Race to 50 or Race to 100: Each player takes a turn rolling a die to see which rod to place on his or her track. For instance, if you roll a 5, you can use the metric ruler on the edge of the rod track to measure the rod you think represents the number 5. You might have to measure a few rods at first to know which one is the right size. Each player takes turns placing corresponding rods on his or her track. After each turn, you can compare the lengths of rod trains on your tracks. Play until one or both players reach the end of the 50cm track. Variations: You can use one die, placing a single rod at a time on the track, or a set of dice to either add or multiply the numbers on the dice. If you’re adding the dice, and you roll a 2 (red rod) and a 3 (light green rod), you can choose to place the red and light green rods or a yellow rod (5) on your track. If you’re multiplying the dice, and you roll a 3 (light green) and a four (purple), that makes 3 fours or 4 threes, so you can place 3 purples or 4 light greens on your track. Race to Zero: This is the reverse game of Race to 50 or 100. Fill up a track with orange rods (10s), roll the die, and subtract rods till you clear the track and get to zero. Trade rods as necessary in order to facilitate subtraction. This is a game that is best played after many games of Race to 50 or 100 because subtraction concepts can be more abstract to think about while becoming familiar with the rods and tracks. Alternately, you could just keep the original rods from a Race to 50 game on the rod tracks, and remove one colored rod at a time according to the number you roll. In this way, there’s no trading involved, just identifying the numbers/colored rods to remove. Race To 50: At this point in the game, one player has reached 28cm and the other has reached 30cm. This is a simple conversational game for young children. It’s adapted from the book, First Grade Diary, p.4 by Robert Hightower and Lore Rasmussen. Can you find “half of” the red rod? Which rod is “half of” the orange rod? Etc. 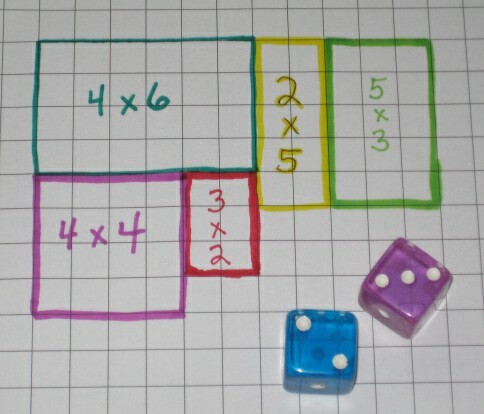 Can you find some “square numbers” by creating Cuisenaire rod squares with 4 fours (purples), 5 fives (yellows), or 6 sixes (greens)? If you then shift them into lines on a rod track, you can confirm their totals. 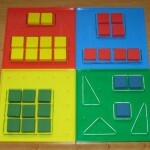 For example, a 4×4 = 16, a 5×5 = 25, and a 6×6 = 36. 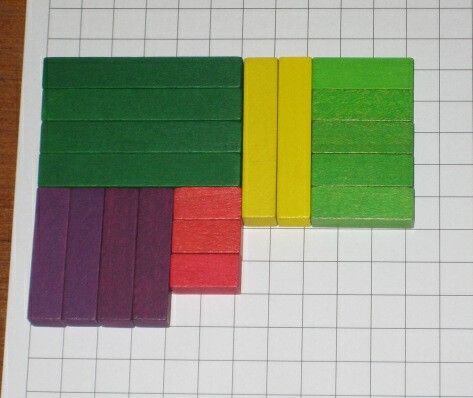 Use centimeter graph paper and some Cuisenaire rods to play this game of building rectangles. Roll a set of dice. The 1st roll tells how long a rod to use; the 2nd roll tells how many of that colored rod to take. 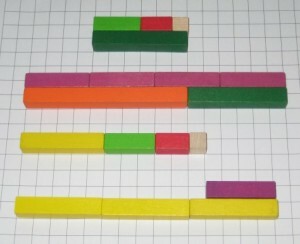 Arrange the rods into a rectangle. You can place the rod rectangles on a sheet of centimeter graph paper, or also trace them on the paper and write the related multiplication sentence inside each rectangle. (For example, 3×5=15, or 4×6= 24) Play until the graph paper is covered with as many rod rectangles as possible. 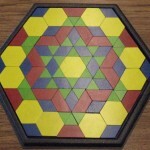 This game is adapted from the book, About Teaching Mathematics: A K-8 Resource, 3rd Edition, p.201 by Marilyn Burns. 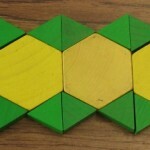 How Long, How Many: One way to play this game is after you place the rod rectangles on the paper, such as 4 of the sixes (dark greens), you can trace the rectangles and label them (4 of 6, or 4 x 6). If an orange rod is considered one whole, then a yellow rod is one of two parts, or ½ of an orange rod. If a brown rod is one whole, then a red rod is one of four parts, or 1/4 of a brown rod. If a blue rod is considered one whole, then a light green rod is one of three parts, or 1/3 of a blue rod. There are numerous problems like these from the book, Hidden Rods, Hidden Numbers by Manon Charbonneau. 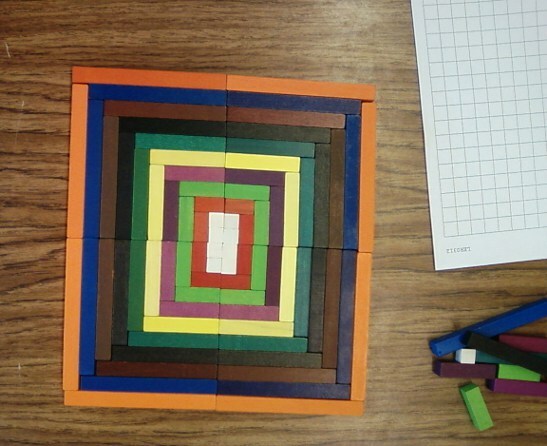 It was re-published with a new title, Critical Thinking Puzzles with Cuisenaire Rods. I think they’re both out of print now, but you might be able to find a used copy. I found my copy of the first title many years ago at Math ‘n’ Stuff in Seattle. Of course, you can always just make up your own similar guessing games. Be sure to let your kids take a turn choosing the rods and clues, too. 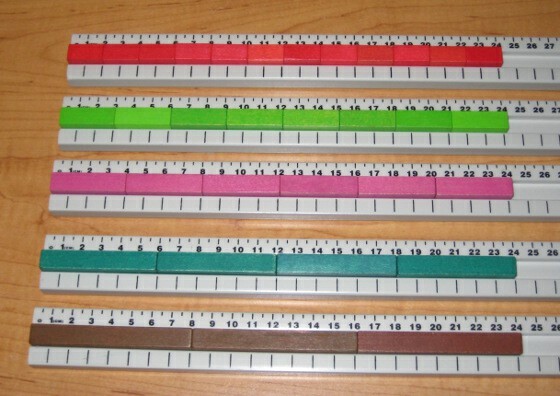 Where did you purchase the cuisenaire rod tracks, please? I’ve purchased the rod tracks at Math ‘n’ Stuff in Seattle (a long time ago), as well as from the ETA Cuisenaire online store more recently. I recently got these rods and mine dont have the cm marked either and Im at odds as to how to use them? Do you tell the child this is a 1 this a 2 this 3 etc or just let them figure it out themselves? I see you use squared paper and the rod tracker which I guess must help quite a bit in terms of knowing the number. Hi, I think the best thing to do is just play with them! Kids like to create designs with them or build upwards with them, and in doing so, they tend to notice the varying lengths of each rod and the colors that go with them. I like that mine don’t have the cm markings because then it’s easier to just notice the color difference first, and then eventually the length variations. The rods that have cm markings on them are often part of a more formalized math curriculum package, and then I think kids just think of them as only math-related or something to do as part of a lesson. If instead, you treat them as fun and interesting as any other colorful set of blocks they might like, I think everyone enjoys them more. Of course since you know that they’re based on centimeters, there’s no reason you shouldn’t mention that. Kids like to explore the sizes and figure out that it takes ten of the single tan rods to make up the same length as an orange rod, or five of them to make the length of a yellow rod. The centimeter graph paper and the Cuisenaire rod tracks also make it easy to play a variety of number games with the rods. Have fun with them! Hi Kelly, We’ve loved playing games with Cuisenaire rods over the years so it’s been fun for me to share these ideas with others. Enjoy! Games are great! Thank you for ideas! I love games, too, and I’m glad you like the ideas! Thanks for commenting. 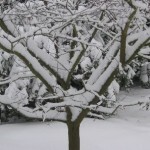 I include info about your web site and your great ideas on my blog. 🙂 Thank you for inspiration! 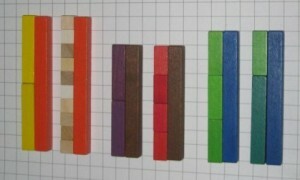 I’ve used the rods for years to introduce math concepts to children. If you are struggling for ideas please visit my site. I’m also giving away a Cuisenaire Rod app that I use in all my video tutorials. These rods are used in New Zealand to teach Te Reo Maori language. It works really successfully. That’s wonderful! Thanks for sharing this connection.